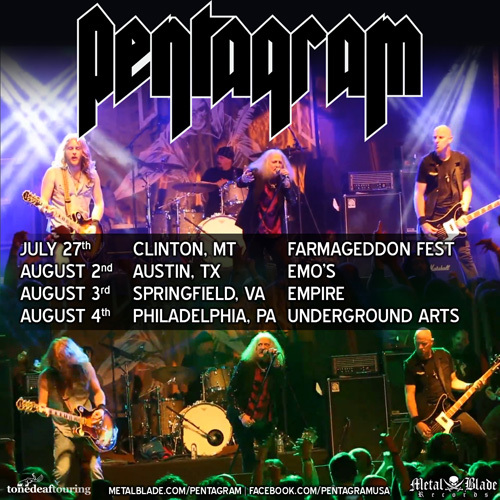 Doom legends, PENTAGRAM, announced shows in the US this summer. These shows will follow the previously announced festival dates in Europe throughout July. The complete list of dates including the US shows are listed below, and facebook.com/pentagramusa. In other news, premium subscription channel SHOWTIME just picked up the documentary Last Days Here from influential doom legends PENTAGRAM–showings can be found HERE. PENTAGRAM’s most recent album, Last Rites, was released via Metal Blade Records on April 14, 2011 and their first ever official DVD (also out on Metal Blade), When the Screams Come, on August 30, 2011. Both releases were met by rave reviews from fans and critics alike and saw the band playing sets at infamous SXSW festival in Austin TX as well as tours across the US and dates in Europe. Recently, after months of searching and reviewing literally hundreds of applicants from around the world, PENTAGRAM announced the addition of their new guitarist Matt Goldborough. His debut with the “Ram Family,” rounded out by Bobby Liebling on vocals, Greg Turley on bass guitar and Sean Saley on drums, was on April 16, 2013 at the sold out show at Saint Vitus Bar in Brooklyn, NY. If that gig wasn’t special enough, the band performed songs not heard live in over 40 years! Inspired by a demand from the fans, Liebling and company pulled out rare gems, including Be Forewarned. This track and more can be viewed now at metalinjection.net. This entry was posted in METAL and tagged Austin Texas, Bobby Liebling, Brooklyn, Entertainment, Last Days Here, Metal Blade Records, oscars, Pentagram, Philadelphia, United States. Bookmark the permalink. ← New Album Reviews Page Launch!